Feral/Stray Cats | Alter-Ations Inc.
Feral cats are members of the domestic cat species and are protected under anti-cruelty laws, they are typically fearful of humans. Feral cats should not be taken to animal control pounds. Feral cats’ needs are generally not met by animal control and shelter systems because animals who are not adoptable are killed. Find a shelter which has a feral cat program to help you. Feral kittens can be adopted. Feral kittens can often be adopted into homes, but they must be socialized first. If they aren’t handled in time, they will remain feral and therefore “unadoptable”. Feral cats can have the same lifespan as pet cats. And they are just as healthy, too. The incidence of disease in feral cat colonies is just the same as for pet cats. Humans are the cause of wildlife and bird depletion. Studies show that the overwhelming cause of wildlife depletion is destruction of habitat, chemical pollution, pesticides, and drought. Cats do hunt birds (as well as mice, rats, snakes, and lizards!) but have only a slight impact on overall populations. Catch and kill doesn’t work. The endless, cruel cycle of catch and kill is extremely costly to taxpayers. Cats will congregate wherever there is food and shelter. When a population of cats is removed, other cats will move in…………and the cycle of catch and kill continues. Trap-Neuter-Return does work. No more kittens. The population stabilizes and their lives are improved. Behaviors such as roaming, yowling, and fighting stop. Cats are vaccinated prior to being returned to their colony so they won’t catch – or spread – disease. An example of a cat who has been ear-tipped. An ear tip means that this cat has been altered and vaccinated. 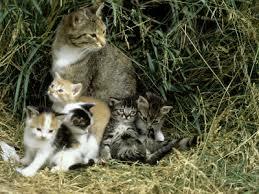 We can help with trapping, spaying or neutering, and returning feral cats in your neighborhood. Call us at 608-638-6887 or e-mail alterationsinc@yahoo.com. Questions about trapping cats? 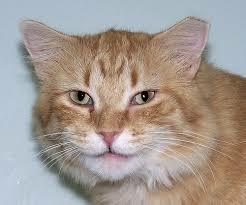 Alley Cat Allies is a recognized leader in Trap/Neuter/Release. Click Trapping Guide to get instructions on how to trap cats. Our staff can also answer questions or help. Taking care of a cat colony? Click Colony Care Guide to download the Colony Cat Care Guide! 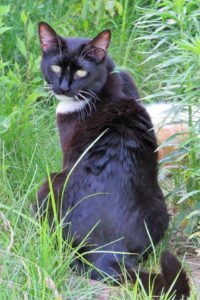 Many thanks to Alley Cat Allies (www.alleycat.org) and the Feral Cat Project (www.feralcatproject.org) for their information, assistance, and long term advocacy for our feral cats.